The hawksbill sea turtle (Eretmochelys imbricata) is a Critically Endangered sea turtle belonging to the family Cheloniidae. It is the only extant species in the genus Eretmochelys. The species has a worldwide distribution, with Atlantic and Indo-Pacific subspecies—E. i. imbricata and E. i. bissa, respectively. The hawksbill's appearance is similar to that of other marine turtles. In general, it has a flattened body shape, a protective carapace, and flipper-like limbs, adapted for swimming in the open ocean. E. imbricata is easily distinguished from other sea turtles by its sharp, curving beak with prominent tomium, and the saw-like appearance of its shell margins. Hawksbill shells slightly change colors, depending on water temperature. While this turtle lives part of its life in the open ocean, it spends more time in shallow lagoons and coral reefs. The World Conservation Union, primarily as a result of Human fishing practices, classifies E. imbricata as critically endangered. 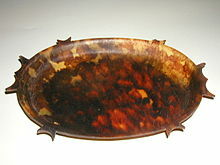 Hawksbill shells were the primary source of tortoiseshell material used for decorative purposes. The Convention on International Trade in Endangered Species outlaws the capture and trade of hawksbill sea turtles and products derived from them. Adult hawksbill sea turtles typically grow to 1 m (3 ft) in length, weighing around 80 kg (180 lb) on average. The heaviest hawksbill ever captured weighed 127 kg (280 lb). The turtle's shell, or carapace, has an amber background patterned with an irregular combination of light and dark streaks, with predominantly black and mottled-brown colors radiating to the sides. One of the hawksbill's more easily distinguished characteristics is the pattern of thick scutes that make up its carapace. While its carapace has five central scutes and four pairs of lateral scutes like several members of its family, E. imbricata's posterior scutes overlap in such a way as to give the rear margin of its carapace a serrated look, similar to the edge of a saw or a steak knife. The turtle's carapace has been known to reach almost 1 m (3 ft) in length. The hawksbill appears to frequently employ its sturdy shell to insert its body into tight spaces in reefs. Crawling with an alternating gait, hawksbill tracks left in the sand are asymmetrical. In contrast, the green sea turtle and the leatherback turtle have a more symmetrical gait. The hawksbill sea turtle has been shown to be biofluorescent and is the first reptile recorded with this characteristic. It is unknown if this is derived from the turtle's diet, which includes biofluorescent organisms like the hard coral Physogyra lichtensteini. Males have more intense pigmentation than females, and a behavioural role of these differences is speculated. Hawksbill sea turtles have a wide range, found predominantly in tropical reefs of the Indian, Pacific, and Atlantic Oceans. Of all the sea turtle species, E. imbricata is the one most associated with warm tropical waters. Two major subpopulations are known, in the Atlantic and Indo-Pacific. Another model of the possible distribution of E. imbricata: Red circles represent known major nesting sites. Yellow circles are minor nesting sites. In the Atlantic, hawksbill populations range as far west as the Gulf of Mexico and as far southeast as the Cape of Good Hope in South Africa. They live off the Brazilian coast (specifically Bahia, Fernando de Noronha) through southern Florida and the waters off Virginia. In the Indian Ocean, hawksbills are a common sight along the east coast of Africa, including the seas surrounding Madagascar and nearby island groups, and all along the southern Asian coast, including the Persian Gulf, the Red Sea, and the coasts of the Indian Subcontinent and Southeast Asia. They are present across the Malay Archipelago and northern Australia. Their Pacific range is limited to the ocean's tropical and subtropical regions. In the west, it extends from the southwestern tips of the Korean Peninsula and the Japanese Archipelago south to northern New Zealand. The Philippines hosts several nesting sites, including the island of Boracay and Punta Dumalag in Davao City. Dahican Beach in Mati City, Davao Oriental hosts one of the most important hatcheries of its kind along with Olive Riley Turtles in the archipelagic country of the Philippines. A small group of islands in the southwest of the archipelago has been named the "Turtle Islands" because two species of sea turtles nest there: the hawksbill and the green sea turtle. In January 2016, a juvenile was seen in Gulf of Thailand. A 2018 article by The Straits Times reported that around 120 hawksbill juvenile turtles recently hatched at Pulau Satumu, Singapore. Commonly found in Singapore waters, hawksbill turtles have returned to areas such East Coast Park and Palau Satumu to nest. In Hawaii, hawksbills mostly nest on the "main" islands of Oahu, Maui, Molokai, and Hawaii. In Australia, hawksbills are known to nest on Milman Island in the Great Barrier Reef. Hawksbill sea turtles nest as far west as Cousine Island in the Seychelles, where the species has been legally protected since 1994, and the population is showing some recovery. The Seychelles' inner islands and islets, such as Aldabra, are popular feeding grounds for immature hawksbills. In the eastern Pacific, hawksbills are known to occur from the Baja Peninsula in Mexico south along the coast to southern Peru. Nonetheless, as recently as 2007, the species had been considered largely extirpated in the region. Important remnant nesting and foraging sites have since been discovered in Mexico, El Salvador, Nicaragua, and Ecuador, providing new opportunities for research and conservation. In contrast to their traditional roles in other parts of the world, where hawksbills primarily inhabit coral reefs and rocky substrate areas, in the eastern Pacific, hawksbills tend to forage and nest principally in mangrove estuaries, such as those present in the Bahia de Jiquilisco (El Salvador), Gulf of Fonseca (Nicaragua, El Salvador, and Honduras), Estero Padre Ramos (Nicaragua), and the Gulf of Guayaquil (Ecuador). Multi-national initiatives, such as the Eastern Pacific Hawksbill Initiative, are currently pushing efforts to research and conserve the population, which remains poorly understood. Adult hawksbill sea turtles are primarily found in tropical coral reefs. They are usually seen resting in caves and ledges in and around these reefs throughout the day. As a highly migratory species, they inhabit a wide range of habitats, from the open ocean to lagoons and even mangrove swamps in estuaries. Little is known about the habitat preferences of early life-stage E. imbricata; like other young sea turtles, they are assumed to be completely pelagic, remaining at sea until they mature. While they are omnivorous, sea sponges are their principal food; they constitute 70–95% of the turtles' diets. However, like many spongivores, they feed only on select species, ignoring many others. Caribbean populations feed primarily on the orders Astrophorida, Spirophorida, and Hadromerida in the class Demospongiae. Aside from sponges, hawksbills feed on algae, cnidarians, comb jellies and other jellyfish, and sea anemones. They also feed on the dangerous jellyfish-like hydrozoan, the Portuguese man o' war (Physalia physalis). Hawksbills close their unprotected eyes when they feed on these cnidarians. The man o' war's stinging cells cannot penetrate the turtles' armored heads. Not much is known about the life history of hawksbills. Their life history can be divided into three phases, namely the pelagic phase, from hatching to about 20 cm, the benthic phase, when the immature turtles recruit to foraging areas, and the reproductive phase, when they reach sexual maturity. The pelagic phase possibly lasts until the turtles reach around 20 cm in length in 1–3 years, reaching sexual maturity at around 40 cm (2–4 years). Hawksbills show a degree of fidelity after recruiting to the benthic phase, however movement to other similar habitats is possible. Hawksbills mate biannually in secluded lagoons off their nesting beaches in remote islands throughout their range. The most significant nesting beaches are in Mexico, the Seychelles, Indonesia, and Australia. Mating season for Atlantic hawksbills usually spans April to November. Indian Ocean populations, such as the Seychelles hawksbill population, mate from September to February. After mating, females drag their heavy bodies high onto the beach during the night. They clear an area of debris and dig a nesting hole using their rear flippers, then lay clutches of eggs and cover them with sand. Caribbean and Florida nests of E. imbricata normally contain around 140 eggs. After the hours-long process, the female returns to the sea. Their nests can be found throughout beaches in about 60 countries. Hawksbills evidently reach maturity after 20 years. Their lifespan is unknown. Like other sea turtles, hawksbills are solitary for most of their lives; they meet only to mate. They are highly migratory. Because of their tough carapaces, adults' only predators are sharks, estuarine crocodiles, octopuses, and some species of pelagic fish. A series of biotic and abiotic cues, such as individual genetics, foraging quantity and quality, or population density, may trigger the maturation of the reproductive organs and the production of gametes and thus determine sexual maturity. Like many reptiles, all marine turtles of a same aggregation are highly unlikely to reach sexual maturity at the same size and thus age. Age at maturity has been estimated to occur between 10 and 25 years of age for Caribbean hawksbills. Turtles nesting in the Indo-Pacific region may reach maturity at a minimum of 30 to 35 years. Fitzinger derived the genus name, Eretmochelys, from the Greek roots eretmo and chelys, corresponding to "oar" and "turtle", respectively. The name refers to the turtles' oar-like front flippers. The species name imbricata is Latin, corresponding to the English term imbricate. This appropriately describes the turtles' overlapping posterior scutes. The Pacific hawksbill's subspecies name, bissa, is Latin for "double". The subspecies was originally described as Caretta bissa; the term referred to the then-species being the second species in the genus. Caretta is the genus of the hawksbill's much larger relative, the loggerhead turtle. Many cultures also use turtle shells for decoration. These turtles have been harvested for their beautiful shell since Egyptian times, and the material known as tortoiseshell is normally from the hawksbill. In China, where it was known as tai mei, the hawksbill is called the "tortoise-shell turtle", named primarily for its shell, which was used for making and decorating a variety of small items, as it was in the West. Along the south coast of Java, stuffed hawksbill turtles are sold in souvenir shops, though numbers have decreased in the last two decades. In Japan, the turtles are also harvested for their shell scutes, which are called bekko in Japanese. It is used in various personal implements, such as eyeglass frames and the shamisen (Japanese traditional three-stringed instrument) picks. In 1994, Japan stopped importing hawksbill shells from other nations. Prior to this, the Japanese hawksbill shell trade was around 30,000 kg (66,000 lb) of raw shells per year. In the West, hawksbill sea turtle shells were harvested by the ancient Greeks and ancient Romans for jewellery, such as combs, brushes, and rings. The bulk of the world's hawksbill shell trade originates in the Caribbean. In 2006, processed shells were regularly available, often in large amounts, in countries including the Dominican Republic and Colombia. Consensus has determined sea turtles, including E. imbricata to be, at the very least, threatened species because of their slow growth and maturity, and slow reproductive rates. Many adult turtles have been killed by humans, both accidentally and deliberately. Their existence is threatened due to pollution and loss of nesting areas because of coastal development. Biologists estimate that the hawksbill population has declined 80 percent in the past 100–135 years. Human and animal encroachment threatens nesting sites, and small mammals dig up the eggs to eat. In the US Virgin Islands, mongooses raid hawksbill nests (along with those of other sea turtles, such as Dermochelys coriacea) right after they are laid. The species (along with the entire family Cheloniidae) has been listed on Appendix I of the Convention on International Trade in Endangered Species. It is prohibited to import or export turtle products, or to kill, capture, or harass hawksbill sea turtles. ^ "Eretmochelys imbricata (Linnaeus, 1766)". Integrated Taxonomic Information System. Retrieved 5 February 2007. ^ a b CITES (2006-06-14). "Appendices". Convention on International Trade in Endangered Species of Wild Flora and Fauna. Archived from the original (SHTML) on 2007-02-03. Retrieved 2007-02-05. ^ a b c d "Species Booklet: Hawksbill sea turtle". Virginia Fish and Wildlife Information Service. Virginia Department of Game & Inland Fisheries. Archived from the original on 2006-09-24. Retrieved 2007-02-06. ^ "Hawksbill turtle – Eretmochelys imbricata: More information". Wildscreen. Archived from the original on 2007-03-28. Retrieved 2007-02-05. ^ a b c d e f "Eretmochelys imbricata, Hawksbill Sea Turtle". MarineBio.org. Retrieved 2007-02-05. ^ Witherington, B. (2006). Sea Turtles: An Extraordinary History of Some Uncommon Turtles. Minnesota: Voyager Press. ^ "The Hawksbill Turtle (Eretmochelys imbricata)". turtles.org. Archived from the original on 2007-02-21. Retrieved 2007-02-22. ^ a b c "Hawksbill". SeychellesTurtles.org - Strategic Management of Turtles. Marine Conservation Society, Seychelles. Archived from the original on 2007-10-17. Retrieved 2007-02-22. ^ "The Hawksbill Turtle: Eretmochelys imbricata". Auckland Zoo. Archived from the original on October 9, 2007. Retrieved 2007-07-14. ^ Jane J. Lee. "Exclusive Video: First "Glowing" Sea Turtle Found". National Geographic. ^ Gruber, David F.; Sparks, John S. (2015). "First Observation of Fluorescence in Marine Turtles". American Museum Novitates. 3845 (3845): 1–8. doi:10.1206/3845.1. hdl:2246/6626. ^ a b c "Species Fact Sheet: 'FIGIS - Fisheries Global Information System". United Nations. 2006. Retrieved 2009-06-14. ^ a b c "Hawksbill Sea Turtle (Eretmochelys imbricata)". North Florida Field Office. United States Fish and Wildlife Service. 2005-12-09. Retrieved 2007-02-18. ^ Formia, Angela; Tiwari, Manjula; Fretey, Jacques; Billes, Alexis (2003). "Sea Turtle Conservation along the Atlantic Coast of Africa". Marine Turtle Newsletter. 100: 33–37. Retrieved 2007-02-18. ^ Beggs, Jennifer A.; Horrocks, Julia A.; Krueger, Barry H. (2007). "Increase in hawksbill sea turtle Eretmochelys imbricata nesting in Barbados, West Indies" (PDF). Endangered Species Research. 3: 159–168. doi:10.3354/esr003159. Retrieved 2010-12-06. ^ Kamel, Stephanie Jill; Delcroix, Eric (2009). "Nesting Ecology of the Hawksbill Turtle, Eretmochelys imbricata, in Guadeloupe, French West Indies from 2000–07". Journal of Herpetology. 43 (3): 367–76. doi:10.1670/07-231R2.1. ^ Bjorndal, Karen A.; Bolten, Alan B.; Lagueux, Cynthia J. (1993). "Decline of the Nesting Population of Hawksbill Turtles at Tortuguero, Costa Rica". Conservation Biology. 7 (4): 925–7. doi:10.1046/j.1523-1739.1993.740925.x. JSTOR 2386826. ^ a b Heppel, Selina S.; Larry B. Crowder (June 1996). "Analysis of a Fisheries Model for Harvest of Hawksbill Sea Turtles (Eretmochelys imbricata)". Conservation Biology. 10 (3): 874–880. doi:10.1046/j.1523-1739.1996.10030874.x. JSTOR 2387111. ^ Bowen, B. W.; Bass, A. L.; Garcia-Rodriguez, A.; Diez, C. E.; Van Dam, R.; Bolten, A.; Bjorndal, K. A.; Miyamoto, M. M.; Ferl, R. J. (1996). "Origin of Hawksbill Turtles in a Caribbean Feeding Area as Indicated by Genetic Markers". Ecological Applications. 6 (2): 566–72. doi:10.2307/2269392. JSTOR 2269392. ^ Colacion, Artem; Danee Querijero (2005-03-10). "Uriel's journey home — a Young pawikan's story in Boracay". The Philippine STAR. Archived from the original on 2006-02-18. Retrieved 2007-02-06. ^ "Ocean Ambassadors - Philippine Turtle Islands". Coastal Resource & Fisheries Management of the Philippines. OneOcean.org. Retrieved 2007-02-06. ^ Hoover, John P. (2008). The Ultimate Guide to Hawaiian Reef Fishes, Sea Turtles, Dolphins, Whales, and Seals. Mutual Publishing. ISBN 978-1-56647-887-8. ^ Loop, K. A.; Miller, J. D.; Limpus, C. J. (1995). "Nesting by the hawsbill turtle (Eretmochelys imbricata) on Milman Island, Great Barrier Reef, Australia". Wildlife Research. 22 (2): 241–251. doi:10.1071/WR9950241. Retrieved 2007-02-21. ^ Allen, ZC; Shah, N. J.; Grant, A.; Derand, G-D.; Bell, D. (April 2010). "Hawksbill turtle monitoring in Cousin Island" (PDF). Endangered Species Research. 11 (3): 195–200. doi:10.3354/esr00281. Retrieved 23 April 2012. ^ Hitchins, P. M.; Bourquin, O.; Hitchins, S. (2004-04-27). "Nesting success of hawksbill turtles (Eretmochelys imbricata) on Cousine Island, Seychelles". Journal of Zoology. 264 (2): 383–389. doi:10.1017/S0952836904005904. Retrieved 2007-02-21. ^ Gaos, Alexander; et al. (2010). "Signs of Hope in the Eastern Pacific: International collaboration reveals encouraging status of hawksbill turtles in the eastern Pacific" (PDF). Oryx. 44 (4): 595. doi:10.1017/S0030605310000773. Archived from the original (PDF) on July 25, 2011. ^ Gaos, Alexander; et al. (2011). "Shifting the life-history paradigm: discovery of novel habitat use by hawksbill turtles" (PDF). Biol Lett. Archived from the original (PDF) on December 3, 2013. ^ Lutz, P. L.; J. A. Musick (1997). The Biology of Sea Turtles. Boca Raton, Florida: CRC Press. ISBN 978-0-8493-8422-6. ^ Houghton, Jonathan D. R.; Martin J. Callow; Graeme C. Hays (2003). "Habitat utilization by juvenile hawksbill turtles (Eretmochelys imbricata, Linnaeus, 1766) around a shallow water coral reef" (PDF). Journal of Natural History. 37 (10): 1269–1280. doi:10.1080/00222930110104276. Retrieved 2007-03-17. ^ a b Meylan, Anne (1988-01-22). "Spongivory in Hawksbill Turtles: A Diet of Glass". Science. 239 (4838): 393–395. doi:10.1126/science.239.4838.393. JSTOR 1700236. PMID 17836872. ^ a b c Edelman, Michael (2004). "Eretmochelys imbricata: Information". Animal Diversity Web. University of Michigan Museum of Zoology. Retrieved 2007-02-04. ^ Van Dam, R. P.; Diez, C. E. (1997). "Diving behavior of immature hawksbill turtles (Eretmochelys imbricata) in a Caribbean reef habitat". Coral Reefs. 16 (2): 133–8. doi:10.1007/s003380050067. ^ Musick, John A.; Limpus, Colin J. (1996). "Habitat Utilization and Migration in Juvenile Sea Turtles". In Lutz, Peter L.; Musick, John A. The Biology of Sea Turtles. pp. 137–63. ISBN 978-0-8493-8422-6. ^ Witzell, W. N., ed. (1983). Synopsis of biological data on the hawksbill turtle, Eretmochelys imbricata (Linnaeus 1766) (PDF). FAO Fisheries Synopsis. pp. 17, 39–40. ISBN 978-92-5-101356-4. Retrieved 2016-07-09. ^ Limpus, C. J. (1992). "The hawksbill turtle, Eretmochelys imbricata, in Queensland: population structure within a southern Great Barrier Reef feeding ground". Wildlife Research. 19 (4): 489–505. doi:10.1071/WR9920489. ^ Boulon, R.H. 1989. Virgin Island turtle tags recovered outside the U. S. Virgin Islands. In: S.A. Eckert, K.L. Eckert & T.H. Richardson (Compilers). Proceedings of the Ninth Annual Workshop on Sea Turtle Conservation and Biology. U.S. Dept. of Commerce. NOAA Tech. Memo. NMFS-SEFC-232. pp 207. ^ "Atlantic Hawksbill Sea Turtle Fact Sheet". New York State Department of Environmental Conservation. Retrieved 2009-06-10. ^ LIMPUS, C.J., P.J. COUPER & M.A. READ. 1994. The green turtle, Chelonia mydas, in Queensland: population structure in a warm temperate feeding area. Memoirs of the Queensland Museum 35: 139-154. ^ Diez, C. E. & Van Dam, R. P. (2002). Habitat effect on hawksbill turtle growth rates on feeding grounds at Mona and Monito Islands, Puerto Rico. Marine Ecology Progress Series. 234:301-309. ^ Limpus, C.J. and Miller, J.D. 2000. Final Report for Australian Hawksbill Turtle Population Dynamics Project. A Project Funded by the Japan Bekko Association to Queensland Parks and Wildlife Service. Dr. Colin J. Limpus and Dr. Jeffrey D. Miller, Planning and Research Division, Queensland Parks and Wildlife Service, P.O. Box 155, Brisbane Albert Street, Qld 4002, Australia. ^ Mortimer, J.A., Collie, J., Jupiter, T. Chapman, R. Liljevik, A. and Betsy, B. 2003. Growth rates of immature hawksbills (Eretmochelys imbricata) at Aldabra Atoll, Seychelles (Western Indian Ocean). In: J.A. Seminoff (ed. ), Proceedings of the Twenty-Second Annual Symposium on Sea Turtle Biology and Conservation, pp. 247. ^ Bowen, Brian W.; Nelson, William S.; Avise, John C. (15 June 1993). "A Molecular Phylogeny for Marine Turtles: Trait Mapping, Rate Assessment, and Conservation Relevance". Proceedings of the National Academy of Sciences of the United States of America. 90 (12): 5574–5577. doi:10.1073/pnas.90.12.5574. PMC 46763. PMID 8516304. ^ "Testudo imbricata Linnaeus, 1766". Integrated Taxonomic Information System. Retrieved 5 February 2007. ^ "Eretmochelys Fitzinger, 1843". Integrated Taxonomic Information System. Retrieved 5 February 2007. ^ "Eretmochelys imbricata squamata Agassiz, 1857". Integrated Taxonomic Information System. Retrieved 5 February 2007. ^ "Eretmochelys imbricata bissa (Rüppell, 1835)". Integrated Taxonomic Information System. Retrieved 5 February 2007. ^ "Eretmochelys imbricata imbricata (Linnaeus, 1766)". Integrated Taxonomic Information System. Retrieved 5 February 2007. ^ Beltz, Ellin. "Translations and Original Descriptions: Turtles". Scientific and Common Names of the Reptiles and Amphibians of North America - Explained. ebeltz.net. Retrieved 2007-02-06. ^ a b Schafer, Edward H. (1962). "Eating Turtles in Ancient China". Journal of the American Oriental Society. 82 (1): 73–74. doi:10.2307/595986. JSTOR 595986. ^ Nijman, Vincent (2015). "Decade's long open trade in protected marine turtles along Java's south coast". Marine Turtle Newsletter – via ResearchGate. ^ Strieker, Gary (2001-04-10). "Tortoiseshell ban threatens Japanese tradition". CNN.com/sci-tech. Cable News Network LP, LLLP. Archived from the original on March 11, 2007. Retrieved 2007-03-02. ^ Casson, Lionel (1982). "Periplus Maris Erythraei: Notes on the Text". The Journal of Hellenic Studies. 102: 204–206. doi:10.2307/631139. JSTOR 631139. ^ "Turtles of the Caribbean: the curse of illegal trade". Newsroom. World Wide Fund for Nature. 2006-10-01. Archived from the original on March 5, 2007. Retrieved 2007-02-27. ^ Nellis, David W.; Vonnie Small (June 1983). "Mongoose Predation on Sea Turtle Eggs and Nests". Biotropica. 15 (2): 159–160. doi:10.2307/2387964. JSTOR 2387964. ^ Red List Standards & Petitions Subcommittee (2001-10-18). "Ruling of the IUCN Red List Standards and Petitions Subcommittee on Petitions against the 1996 Listings of Four Marine Turtle Species, 18 October 2001" (PDF). International Union for Conservation of Nature and Natural Resources. Archived from the original (PDF) on 6 December 2006. Retrieved 2007-02-05. ^ "Endangered Species Act (ESA)". noaa.gov. ^ "Recovery Plans for Endangered and Threatened Species". noaa.gov. ^ "Species Profile: Hawksbill sea turtle (Eretmochelys imbricata)". USFWS Threatened and Endangered Species System (TESS). United States Fish and Wildlife Service. 1970-06-02. Archived from the original on May 10, 2007. Retrieved 2007-02-05. Wikimedia Commons has media related to Eretmochelys imbricata.